This exam covers math on a level suitable for non-math majors and includes content found in many traditional college mathematics courses. All CLEP exams are created and administered by the College Board. If you are considering this CLEP exam, always remember that each college grants credit for this exam differently. The amount of credits earned is not set by the College Board, but determined by the policies of your preferred college. Remember to contact the college in advance to determine the passing grade for the test. A passing score is typically 50 points. What’s the College Mathematics CLEP Like? Test takers will answer 60 questions within a 90-minute testing period. In addition to the test period, test takers will be allowed time to complete identification questions as per the exam’s instructions. You can find the full exam overview on the College Board’s CLEP College Mathematics page. Because this exam covers multiple math topics, a quality study plan will increase your chances of earning a passing score. 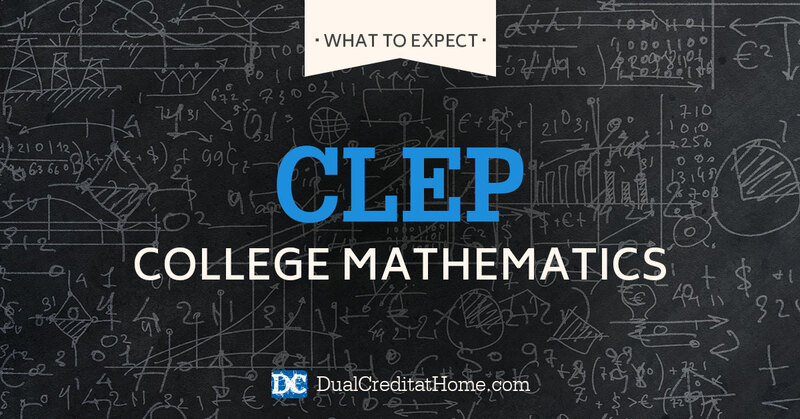 Dual Credit at Home offers a comprehensive College Mathematics CLEP Study Plan. We’ve eliminated all the guesswork of what to study and how to study, so you can successfully pass this exam! Test-takers are allowed access to scientific calculators while taking the test. The TI-30XS MultiView™ is a non-graphing calculator that is integrated within the test taking software and is available to students throughout the entire exam. Test takers may also consult College Board’s website to view a list of recommended text books whose content aligns closely with the concepts that will be tested on the exam. Scheduling: Potential test takers will need to create an online account with the College Board to register for the test and receive scores. You can follow this guide to register for the College Mathematics exam on the CLEP website. Costs: The cost of the College Mathematics CLEP exam is $87. Your local testing center might also charge you a fee, typically $25. If you are in the military, testing is free. Semester Hours: Many colleges will award you 6 lower-level college credit hours, but always check with your preferred college for information about credit hours. Because this exam is traditionally worth six college credits, we prefer it over the CLEP Algebra exam which is worth just three college credits. Dual Credit at Home will give you a complete Study Plan package for taking not just the College Mathematics exam, but 12 more CLEP & DSST exams that can earn you up to 51 college credits.